If you think I have spelt Olympics wrong I haven't! The word Olympics is copyrighted so the school would get a fine if we used it. There were lots of sports but some I missed because of my stookie but it was fun rolling on the paddling pool to get the air out. I wanted to try a tuna baked potato because I have never had one at school before but I have had them at home. I didn't eat the skin of the potato because it was soft and I like them crisp. 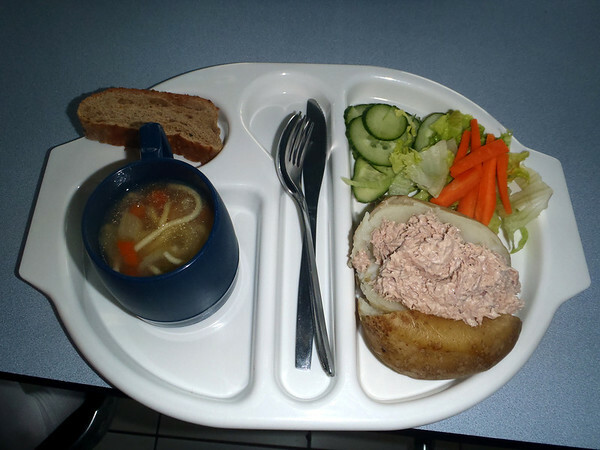 The carrots and salad were nice and crunchy and the tuna was soft. The soup is always hot so I tend to eat it at the end. The mugs we have for soup are blue like the Mary's Meals mugs which the children use but ours are smaller. The soup was chicken noodle but I don't think it has actual chicken but it doesn't matter because it's lovely without. Miriam teaches in South Korea (50 seconds, it was really hard but I found Seoul and I knew it was the capital because of the 1988 Olympics). She says 'lunches are free to the pupils in the elementary school. Clockwise from left- Lettuce, Kimchi (a spicy, fermented cabbage that is a lot nicer than it sounds), a piece of peacan pie, sliced pork, a clear noodle soup with mushrooms, fish cakes, tofu, seaweed and rice cakes, rice. There is also a bowl of hotpaste on the table that you can not see. The lettuce leaves are used likes wraps, and you put some pork, rice and the hot sauce in the middle of a leaf and wrap it up- delicious! Lunches are always the same- rice, kimchi, a soup- then a meat or fish dish. And something sweet- like fruit or a yoghurt. I didn't know you can get metal chopsticks, I thought they are all wooden! I am thrilled that the total on our JustGiving page for Mary's Meals is £91,409.00. It means so much. It's almost 10,000 children receiving a school dinner for a year! Dad sang a song in the car about someone called Lola because a donation came from Barry Manilow. I recognised the song! Nice to read you again today Martha. Keep out your nice work! It is fun to see the foods from different countries - and see how much I can recognize before I read the caption! And it is truly splendid to watch the Mary's Meals totals go up nearly as fast as NeverSeconds page views! My mum loves what you are doing and thinks your an inspiration. She has everyone in the family reading it. It was my 17th birthday so i had a special dinner of Scallops and black pudding followed by steak and potatoes dauphinoise. I like my patato skins crispy too! Looks like a great lunch today Veg! Her name was Lola, she was a showgirl . . . . I still remember it being on the radio all the time..
Not the one by the Kinks then!!!! You are such a bright young girl and demonstrating how to be thoughtful and giving is such a great and shining example for all. Your blog is the highlight of my day and everyone should be so lucky to have a friend like you. Thank you for your blog and your dad for encouraging you! You are wonderful and I wish you all the best in everything you do! Hello, I learnt your initiative. Bravo. And you have a sense of humor! That really looks like a nice meal today. 9/10 is a good rating. Glad you liked it. If you're ever down our way I'll bake you a potato - we have an Aga and they make the best baked spuds ever! It's lovely to see the total is still going up for Mary's Meals - long may it continue! Martha: We think what you are doing is fabulous over here at Peas of Mind headquarters! Bravo from across the pond! We are in San Francisco, California how long did it take you to find us on the map? Question for you: what do you think is the ideal number of mouthfuls that your dinner should be? We are always curious about portion size as we feed kids like you! Let us know if you are looking for a summer internship! Peas to you ! keep up the good work Don't lose your bite! I'm really enjoying your blog. Your story is making the rounds in America via Facebook and it just made me shake my head and laugh. Glad the Council backed down like they usually do when people make a big fuss over a silly decision. I used to live in Cupar, Fife and went to college in Dundee and Cupar. The only thing I ever ate at Dundee was toast and baked potatoes with chile or tuna salad. We should start eating that here. It was very tasty. I hope your stoockie can come off soon, well done for trying something different today! I am so pleased you have raised so much money for Mary's Meals, you have made such a difference to many boys and girls who will now be fed by them. And isn't it interesting to hear from Miriam in Korea that children there get free lunches?! I wonder, if you did a survey at school, whether your friends in your year think having free lunches for everyone is a good idea, or whether actually some of your friends would still prefer to bring in sandwiches from home. I enjoy reading your words and seeing the meal-pictures, Veg. Here's hoping that the cast will come off soon! I am really enjoying your blog, both because you write with such maturity and vibrance as well as the pretty good photos! You are an exceptional young lady, and the funds you have raised for Mary's Meals are extraordinary! Keep up the great work, and God bless in your continued efforts! LOL@ Lola. When I was young I thought Barry Manilow was so awesome. I ever went to one of his concerts. If I could, I would eat potatoes every single day but I am not fond of tuna! The soup looks so good. That meal from South Korea looked good too!!! How about the 6+ million hits???? That is SO great. Keep up the great work! You are so sweet and your blog is so nice! Congratulations for you, your dad and your family. Did you realize that you change many people life? In your country, and around the world. Even a small true is bigger and stronger than a big fat lie. I am from Brazil. I live in a small town called Guaratingueta and I have a pretty 8 years old daughter. Hope she can be as nice and brave as you. I'm afraid it is complete nonsense that the word Olympics is copyrighted, preventing you using it. We have all been using the word for very many years and you can only copyright original works. Your blog is a piece of original work, so you have copyright of it (but you can't stop people copying small parts of it if they do so fairly). Wonderful work for Mary's Meals! I love your blog. I'm from south Texas, and the best thing in our school cafeteria was always the cheese enchiladas. They were SOOO good. Eat in good health and spirits! Great comments. What have we learned today? the fact that Martha's dad can still remember "Copacabana" means he has a great memory. He's probably younger than someone who would choose the Kink's song! Miriam thinks her lunch is free, but there's no such thing as a free lunch. Somebody's paying for it, it's just not her! The International Olympics Committee likes to bully people other than themselves who use the world Olympics, but there were Olympics long before there was an IOC, or indeed any such thing as copyright or trademark law. And, I think, : Tuna potato probably tastes better than it looks in a photo. This is so fantastic what you're doing! I connected through your blog as it was on our news here in California. I showed my daughter (she's 11) your blog and the food you get at school and I must say, she is very very jealous. On days that I have her get a hot lunch at school, she cringes and I don't blame her. The Pizza is greasy, the sandwiches are dry and tasteless and I won't even go into the chili dogs they feed these kids. Yuck! They do get a side fruit and salad if they want but I would love to see her school serve much healthier multi-cultural food. Can't wait for your next blog. I just discovered your blog, and I find it absolutely amazing! I'll definitely be sharing this with my friends. You are doing an admirable thing here, and I wish you all the best! Why not send Veg a photo of the offending meals with rating and comments? Tuna baked potato - yummy! Today's lunch looks delicious! I rarely had school dinners when I was your age as I hated the veg - it was always things like stewed cabbage. My favourite dessert was blancmange [ I thought it was just jelly with milk added but it was more like panna cotta we get now]. I live just 60 miles away from you and our children eat very similar meals, though they don't always choose the veg either! Just found your blog and spent the last hour and a half reading all the posts (read some comments but not all of them or would still be reading) Great job you are doing, raising awareness that school lunches need to be changed. I'm in Ohio (how long will it take for you to find it?) and work in a school and the lunches they get are horrible..it is brought from another school and sometimes cold and just not very healthy. Breakfast is not healthy at all. I'm afraid though children wouldn't eat it around here if it did become more healthier. Parents (not all) have allowed their children to dictate what they are going to eat and parents don't want to battle. I'm fortunate that my children are not picky and love fruits and veggies. they will try anything new (we have a 2 bite rule on new food). My 9 yr old loves asparagus and artichokes. Keep up the great job and I will be checking out Mary's Meals and what my family can do to help. I've never tried tuna on a baked potato. I love your blog :) I think others are right in saying you can use the word "Olympics" anywhere. I have a son that does Special Olympics, and I blog about him all the time and I've never had an issue. I'm also a huge fan of the Olympic Games and I'm really looking forward to watching them again this year (37 days!!). Keep up the great work & I'll keep reading! Love your posts all the way from Singapore! Do you happen to use an iPhone? I am so glad things worked out with the counsel. I wrote them from Austin, TX, and I was surprised and impressed when I received a response; I am certain that they received thousands of complaints and / or emails, and it was nice that they responded. I am curious about how many lunches are served a day. I believe that in my grandson's elementary school they probably serve 300 or more lunches, and I doubt that they would ever be able to offer baked potato to all the students. I am sure you are looking to summer break, and I hope you continue the blog when school starts back up. Your lunches are looking better! I like the looks of the tuna potato especially. I'd like to mention two things that relate to the blog's closure last week. As many people did, I voiced my concern to Argyll and Bute council, and I am happy to report that I have received a highly satisfactory response. The response was in the form of a statement that addressed the ban on photographs, and gives assurance that the council will be meeting with Martha and her Dad to resolve problems. I am sorry to say that the other thing is not quite so positive. I have complained to the Daily Record, the newspaper whose headline caused all the upset and furor, and told them that I feel an apology to Martha is in order. I am afraid that as of yet, no response to that email has been received. As a writer and editor, I always try to be conscious of the people about whom I write stories; words have the power to create great unhappiness if not used wisely. It is my opinion that that duty of care may have been breached by the Daily Record, and I hope the newspaper will accept responsibility soon. Yes, the Daily Record seem to be quite happy to report on the affects of your blog and how much money has been raised for Mary's Meals. Ask them about an apology or even if they have donated to Marys Meals and all you get is silence. Much as they caused this outcry, at least the results are what the people wanted. The difference in the quality of your meals compared to two months ago is very noticeable. Please keep blogging, your messages are very entertaining. School unable to use the Olympics name? Well there is a story right there. Is the IOC (International Olympic Committee?) being a little too heavy handed or has someone somewhere misread the Tearms & Conditions of the use of the Olympics name? My kids school has used the name with the correct spelling on their events. Keep up good job!! Greetings from Poland and all the best!! I read about your blog and decided to have a look at it. You do a great work, really! Unfortunately many schools that I know here, do not have kitchens but only reheating stations for frosted meals, what is really sad! Go on with your work, you are really great! Korean chopsticks are different from Chinese chopsticks. There are a lot thinner, and because they are (usually at least) made from metal, their surface is smoother. So for a Westerner like myself (I'm German) it is much more difficult to eat with them. The Chinese kind (wooden or plastic -- we have a couple of reusable ones that are plastic and go int o the dishwasher like everything else) I can handle, but I struggle with Korean ones. The lunches are getting better. This one looks far more nutritious and tasty than those you were offered a couple of weeks ago. I found out about your blog today from goodnewsnetwork.org and have read through it all. I am awed that you have made such a huge difference to the world - at the age of 9 ! You are an inspiration ! You've raised so much money for Mary's Meals and changed your own schools attitude to lunches. And just as importantly you've also inspired more than 6 million people who have read your blog. I am SO impressed of what you are doing! I keep talking about you to everybody and sharing your blog on facebook as I think your work is fantastic. I wonder, does anybody in the world like baked potatoes with thin soft skins? Let's hear it for crispy skins! It's not difficult to make them crispy, just put them in a hot oven for a bit! Love the idea of your dad singing Barry Manilow hits in the car. And good for Barry, donating to Mary's Meals. Your blog is great! I'm from Norway, and here we don't have hot school lunches at all. There's an ongoing debate whether it should be introduced or not, one argument is that they do so in Sweden and Finland and that the pupils obviously benefit from it. Norway's politicians really need to open their eyes, I think. Instead, everyone here bring packed lunches, and ever since I started school I made my own lunches. This often resulted in hurried, uninspired lunches of dry bread with dull cheese or whatever, so much so that half the time I didn't even finish it, and ended up grumpy and starving by the end of the day. Now that I have a child of my own I'm going to make sure his lunches are better than mine were! I read your blog once before all the fuss started as someone had linked to it on Twitter, now I come and read it every morning to see what you had for lunch and how much money you have raised. So glad you're back. I think I would prefer to eat the Korean lunch! What Roger said! You may find that the counter is a mechanical java kind of counter and that it can only cope with that speed, it could even been counting over as there are more hits than is showing and its trying to keep up. Whatever it is, your comment is pointless, why on earth should there be a change in counter just to please you, its not the page counts that is important, its the message that is being portrayed. The page counter can not keep up. It can only (it seems) go up 1 hit per second, and this blog is getting more than one hit per second. Proof? I wrote down the number if hits, refreshed the page (about 3 seconds) and it went up about 100 hits. 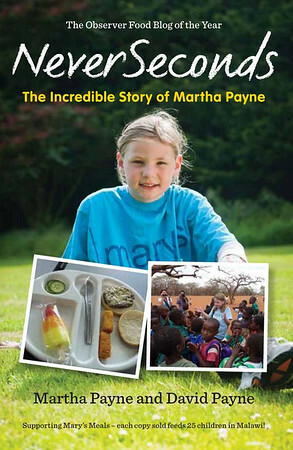 I live in Malawi and i go to a school near a Mary's Meals School. Every lunch time i see hundreds of children eating their Likuni Phala out of their blue mugs. They all look so happy. For some of them this might be the only meal they get. A lot of them are very poor and some of them are orphans. In my school we have to bring our own lunch. What i wanted to say to you is that you have inspired the whole world. I've never had tuna baked potato before, I'll have to try it sometime. Veg I am so glad to see this Monday post. Best of luck with your blogging and congratulations on the amazing amount of money you have raised for Mary's Meals, which is a charity that I also support via my website. 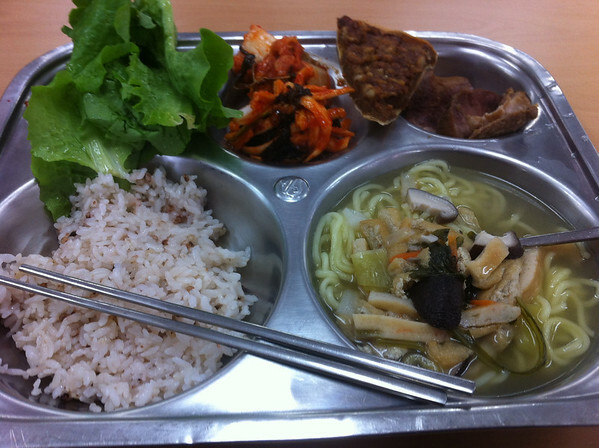 Yay, you got a lunch photo from South Korea! I'm half Korean, and I LOVE their food! Koreans are (as far as I know) the only Asians who use the metal chopsticks. I prefer the wooden ones, though...when I eat noodles with the metal ones, the chopsticks tend to cut the noodles, making it difficult to eat. Not a bad lunch! But I'm like you - I prefer the skin crisp. Soup looks adequate but very greasy! You can see the film of fat from here!! Hiya Veg from Tennessee in the US. Just wanted to drop you a note to tell you what an amazing person you are. Keep up the good work and I have to say I wish my school lunches looked as good as yours do! I love the varied textures and wonderful flavors - and it is not a very difficult cuisine to dabble in. If you can find the varied ingredients where you live - and a cook book or online recipe - I recommend giving Korean cooking a try. Yum! Tuna in a baked potato is one of my husbands favourite meal, he's complaining that I've not done it for a while. I am a bit naughty though, it's not as healthy as yours as I add mayonnaise to the tuna, some black pepper, chopped red onion and lemon juice. I also salt the potato skin for taste and crispness. I serve it with a green salad. Do you get salad dressing for your vegetables? It looks like a small salad that you get sometimes, but I don't think I would like to eat a salad without dressing. My favorite is balsamic vinaigrette. Now that looks like a good school lunch! And Barry Manilow has donated to Mary's Meals? That's wonderful! The Korean meal is making me hungry - I think I might have to treat myself to lunch at my favourite Japanese place tomorrow as you've made me crave lovely noodles and spicy veg! VEG, are you sure about not being able to write Olympicz properly? I do hope not: on my blog which has had aboutI 6.5 million less visits than yours, I had written about a book written by a relative of mine, called The Truce of the Games, which is about the ancient Olympicz in Greece. I have used the correct spelling several times! (You’ll see if you look at www.rosemarysutcliff.com). In any event, I am sure she would have admired your writing the blog. She would probably have used the internet and blogging when she was young (in fact she never went to school until she was ten and left at fourteen). are you sure about not being able to write Olympicz properly? Use of the word "Olympics" is not restricted by copyright, since it would be very hard for copyright to apply to one individual word, but there are substantial limitations on the use of the term — in the UK see, for example, the Olympic Symbol etc. (Protection) Act 1995, as well as the London Olympic Games and Paralympic Games Act 2006. Fun, fun, fun! I think somebody has already told you this but we have free school meals at school, from elementary school to senior high school (like high school/college) and the meals are much better and healthier than the meals you have shown in this blog :S If I needed to eat food like that every day, I don't know what would I do. The food is bought by the money that comes from taxes. Anyways, the education is free in Finland (paid by tax moneys as well).